Fisheries ministers meeting in Brussels to decide EU quotas for next year have set some stocks within levels scientists deem sustainable but left many others vulnerable to overfishing. The ministers also said there would be a review of the planned ban on the discarding of edible fish at sea, which could, in effect, mean the wasteful practice is allowed to continue despite an eight-year battle to end it. 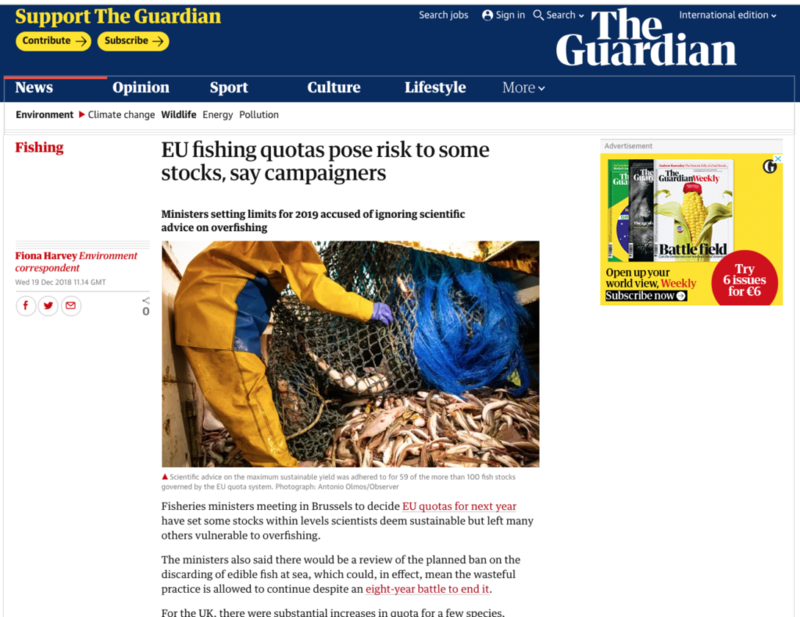 Rebecca Hubbard, the programme director at Our Fish, a campaigning organisation, said: “This should have been the year in which fishing quotas finally followed scientific advice, and EU fisheries ministers made history by ending overfishing in EU waters. The discard ban would also not live up to the promises made by the European commission over the past eight years, Hubbard said. “Fisheries ministers have been procrastinating and seeking exemptions to the ban on discards, including avoiding effective monitoring and control. As a result, widespread discarding is likely to continue in 2019,” she said.